AUTO (VC) Generation Break 2: [Counter Blast 1 & Choose 3 cards from your hand, Discard them] When a battle in which this Unit attacks ends, if you have a “Honorary Professor” Heart Card, you can pay the cost. If you pay it, place this Unit face-up in the G Zone, choose up to 1 Grade 3 “Honorary Professor” from your hand, and Ride it at Stand. If you Ride it, choose all of your Rear-guards, during that turn, they gain Power+4000, and when that turn ends, they’re Retired. 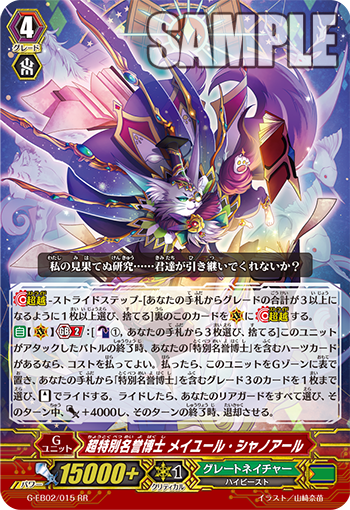 AUTO: [Choose one or more cards with the sum of their grades being 3 or great from your hand, and discard them] When this Unit is placed on (VC), you may pay the cost. If you do, search your deck for up to two cards with “Honorary Professor” in their different card names, put them into your hand, and shuffle your Deck. AUTO (VC): [Counter Blast 1] When your G Unit with “Honorary Professor” in its original card name STRIDE, you may pay the cost. If you do, search your deck for up to one Grade 3 card, put it on your (VC) as a Heart, shuffle your Deck, and if you put a card, return this card to your hand. For Today’s Cards, we’re introducing cards from the Extra Booster “The AWAKENING ZOO” (on sale Friday December 8th, 2017): The 《Great Nature》 『Honorary Professor』 G Unit “Super Honorary Professor, Meileur Chatnoir” and the Grade 3 “Honorary Professor, Chaverite”. “Super Honorary Professor, Meileur Chatnoir” has a pseudo Vanguard Stand Skill. When its attack ends, it places itself face-up in the G Zone to Ride 1 Grade 3 “Honorary Professor” card from your hand! And, all of your ally Rear-guards gain Power+4000 but are Retired at the end of the turn. With this Skill, you can activate the Limit Break Skill of “Honorary Professor, Chatnoir” in the middle of the Battle Phase, while also enhancing the Power of your Rear-guards for explosive chain attacks. Also, you can activate the ability of “Honorary Professor, Chatsauvage”, allowing you to Stride either “Omniscience Dragon, Cath Palug” or “Immortality Professor, Brahmanda” during the Battle Phase, allowing you to super charge your allies while also being able to place the pressure of 6 Drives worth of chain attacks on your opponent! “Honorary Professor, Chaverite” has a Skill to Swap your Heart. When you Stride on top of it, look through your Deck for 1 Grade 3 card, place it in Heart Stand, and Chaverite is returned to your hand. This card is good for placing “Honorary Professor, Chatnoir” as your Heart. Also when it’s placed, you can discard cards whose Grades total 3, and add 2 “Honorary Professor” cards from your Deck to your hand. Add “Honorary Professor, Chatsauvage” to your hand to Break Ride and Stride! These two are sure to improve a “Honorary Professor” Deck! We’ll be introducing more cards from the Extra Booster “The AWAKENING ZOO” in the future!